Photocopied newspaper article from the Oban Times (Thu 3 May 2012) about an exhibition held in An Iodhlann in May 2012 to celebrate Tiree’s famous seamen including Captain Donald MacKinnon, Heanish (1827-1867), who won the Great China Tea Race from Foo Chow to London in 1866. CD and printed lyrics for a song ‘The Donald MacKinnon Story’ by Mavis Ellen Jackson and Robert Bray, 2012. 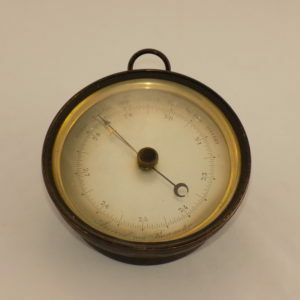 The song recalls the Great China Tea Race of 1866, in which Captain Donald MacKinnon of Heanish (1827-1867), sailed his tea clipper ‘Taeping’ to victory. PowerPoint presentation about Captain Donald MacKinnon, Heanish (1827-1867), who captained the winning tea clipper ‘Taeping’ to victory in the Great China Tea Race of 1866. Used to illustrate a talk given on Tiree in 2012 by Lloyd Pitcher, an Australian descendent. Includes biographical and genealogical information. 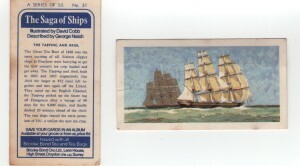 Two small identical cards collected from Brooke Bond tea packets in the late 1960’s, showing an illustration of the tea clipper ‘Taeping’ on one side and with information on the other. 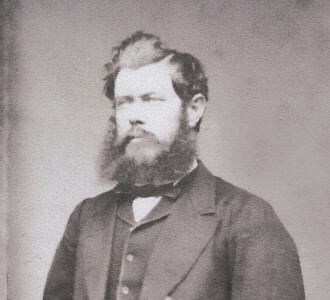 The Taeping was captained by Donald MacKinnon, Heanish, during the Great China Tea Race of 1866. Oval, wood-framed profile of Captain Donald MacKinnon, Heanish, moulded from white wax in 1867. Captain MacKinnon was captain of the tea clipper ‘Taeping’ which won the Great China Tea Race of 1866. The portrait is believed to have been made by William Murray of Glasgow, whose daughter, Margaret Anne Murray, married Donald MacKinnon in 1855. 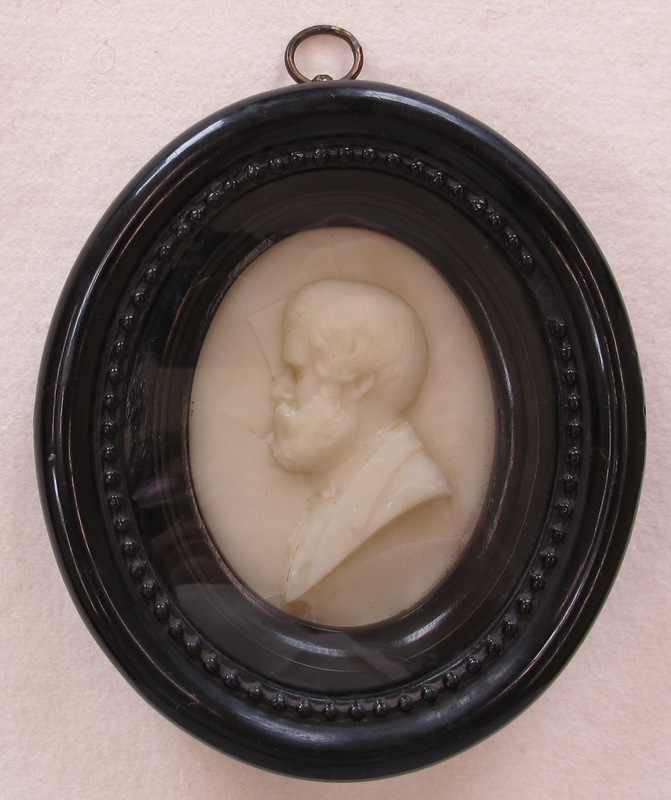 William Murray is known to have made wax and plaster portraits of his relatives as gifts, and probably sent this one to Captain MacKinnon to celebrate his success in the race. 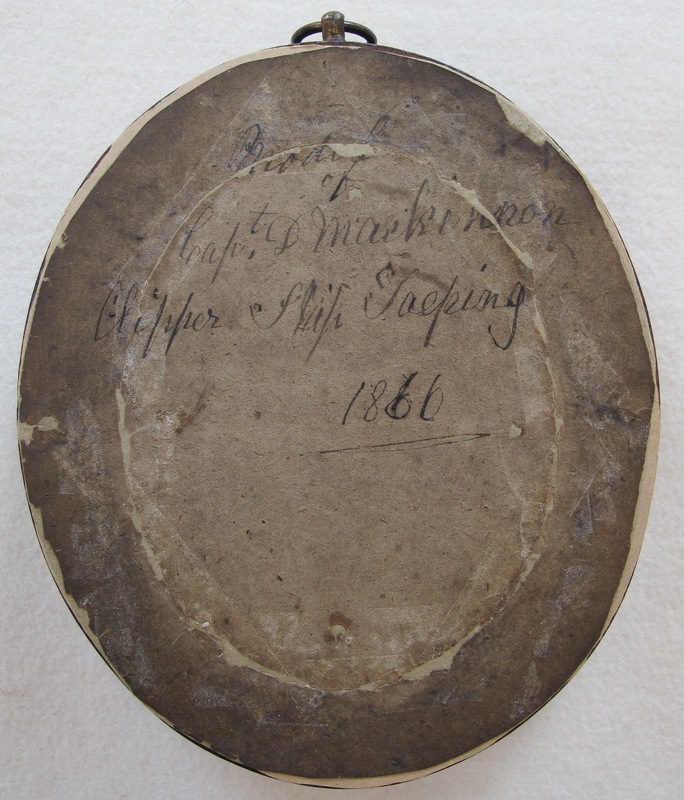 After Captain MacKinnon died aboard ‘SS Roman’ in Table Bay, South Africa in 1867, the plaque was most likely still among his possessions aboard ‘Taeping’, and would have been retrieved by his wife when the ship returned to London. The portrait hung on the wall of the donor’s mother’s home (near Oban?) for many years, from at least 1970 to 2015. The family connection is not certain although there is a Flora MacKinnon born around the 1760s in the family tree, and who may have been a relation of Captain MacKinnon’s grandfather. When the portrait arrived at An Iodhlann, the wax was broken into many pieces and the label on the back had been cut out. It was sent to the Scottish Conservation Studio at Hopetoun House, Queensferry for restoration, where conservators discovered that there had been two previous attempts to repair it, once with candle wax and once with sellotape. Booklet about Captain Donald MacKinnon, Heanish. Home published booklet about Captain Donald MacKinnon of Heanish (1827-1866) by his Australian descendent Lloyd Pitcher. Capt MacKinnon sailed the tea clipper `Taeping` to victory in the Great China Tea Race of 1866. 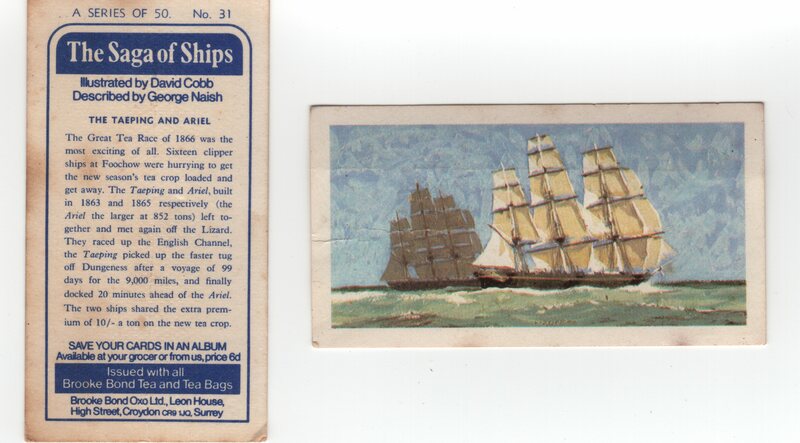 Two laminated original newspaper pages from The Illustrated London News 1866 and 1867 commemorating the life and death of Captain Donald MacKinnon and his victory in winning the Great China Tea Race of 1866, plus two scanned prints of the same. Large scanned print of an original full-length photographic portrait of Captain Donald MacKinnon who sailed the Taeping to victory during the Great China Tea Race of 1866. Black & white photograph of Captain Donald MacKinnon, Heanish, who sailed the tea clipper `Taeping` to victory in the Great China Tea Race of 1866. Scanned from a full-length photograph 2012.133.3 stored in filing cabinet 4 drawer 4. CD containing a PowerPoint slide show presentation about the life of Captain Donald MacKinnon of Heanish, who won the Great China Tea Race of 1866. Includes slide annotations on paper.